Los Angeles-based architect Victor Gruen designed Southdale Center, the first fully enclosed, climate-controlled shopping mall in the United States. Located in the first ring Minneapolis suburb of Edina, Southdale was developed by the Dayton Company, a department store chain and predecessor of Target Corporation, which along with Donaldson’s, Woolworths, and Walgreens Pharmacy would serve as the mall’s original anchor stores. Gruen, a Viennese emigre and a socialist, envisioned Southdale as a kind of town square, a place for social gathering as well as shopping, drawing inspiration from the grand shopping arcades of Europe. 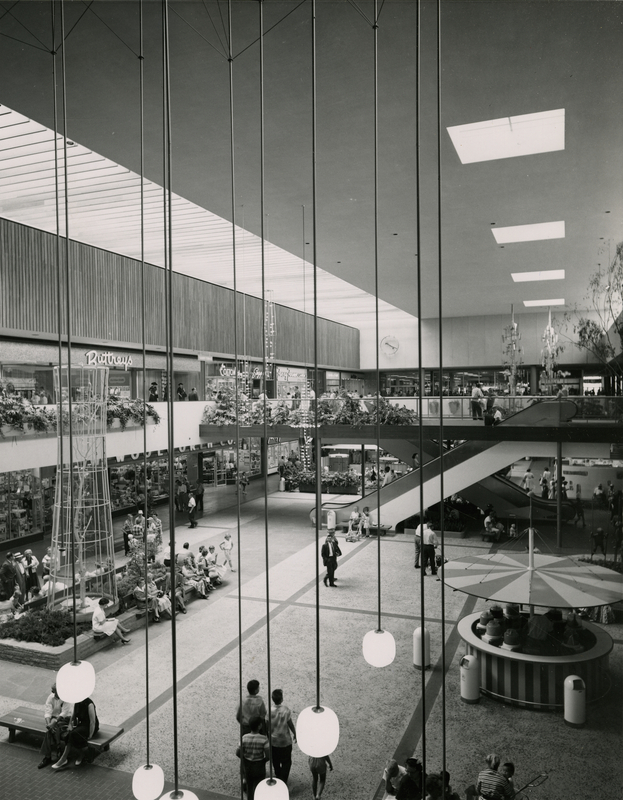 The original Southdale Center included room for more than 70 shops and 5,000 outdoor parking spaces as well as fountains, a goldfish pond, plants and flowers, cafés, an aviary, and works of art, including sculptures by Harry Bertoia. A site for beauty contests, concerts, and other civic and cultural events, Southdale Center was an immediate success with more than 40,000 visitors on opening day. Gruen’s “invention” of the modern suburban shopping mall would be replicated across the country, albeit in less glamorous designs, a legacy from which he tried to distance himself.